Full-service asking rents rose by $0.04 per sq. 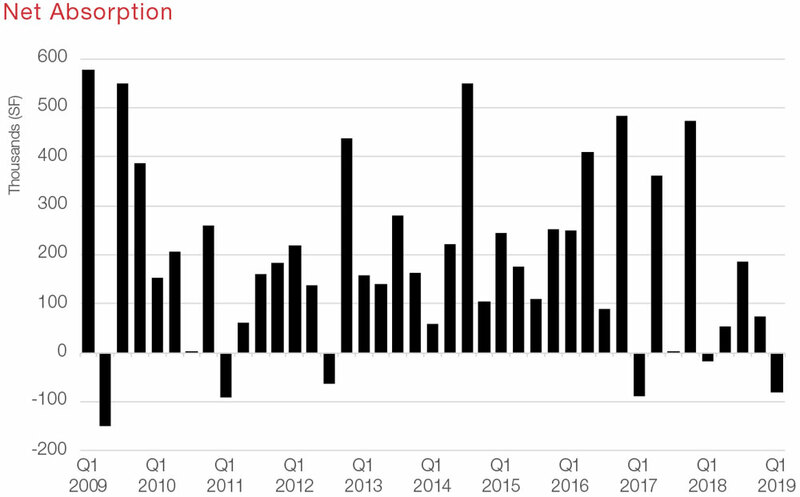 ft. quarter-over-quarter to close Q1 2019 at $22.54—an all-time high—with an increase of $0.59 per sq. ft. (2.7%) year-over-year. 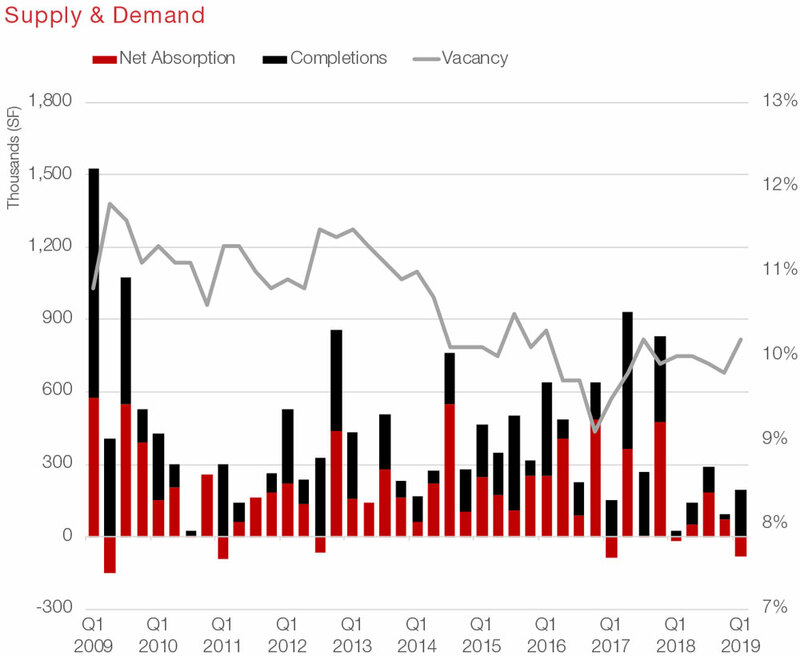 San Antonio’s overall vacancy rate was 10.2% ending Q1 2019, up 40 basis points quarter-over-quarter and 20 basis points year-over-year. Net absorption reflected more tenants moving out than moving in at negative 82,000 sq. ft. at quarter’s end, down from positive 73,000 sq. ft. as of Q4 2018. There was 192,000 sq. ft. delivered to the market during the first quarter, with 34.0% available for lease. San Antonio’s leasing activity stood at 441,000 sq. ft., down from 652,000 sq. ft. the previous quarter, and 546,000 sq. ft. a year ago. The amount of space under construction ended Q1 2019 at 1.4 million sq. ft., including buildings that are primarily owner-occupied. The unemployment rate increased slightly to 3.4% in December, up from 3.2% in October. Though some sectors were weak due to the tight jobs market, overall job growth in San Antonio in 2019 should be similar to the state as a whole, somewhere between 1% and 2%, reported the Dallas Fed. Low unemployment can be problematic when it comes to economic development in some of the city’s industries, especially tech and manufacturing, when there aren’t enough qualified workers for the number of job openings that exist. Capitalizing on population growth and developing the local workforce will be in focus during 2019. Overall vacancy in the suburban office market was at 10.4%, while overall vacancy in the CBD registered at 9.2%. The CBD has 2.5 million sq. 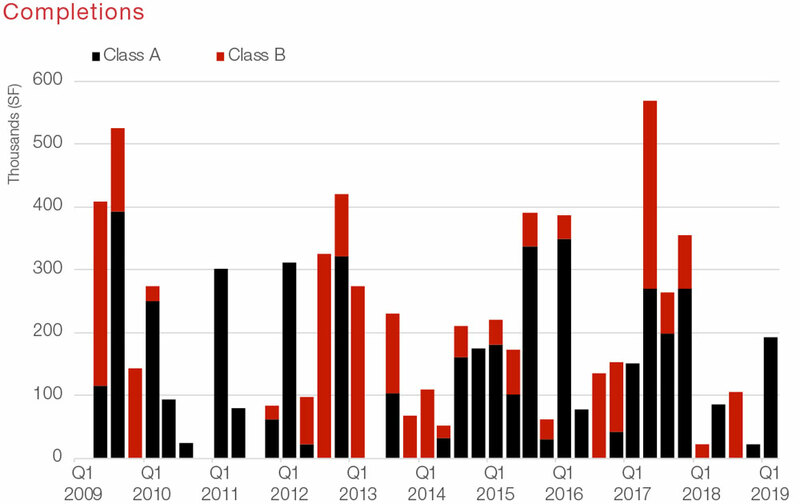 ft. of Class A inventory tracked in 12 buildings with 212,000 sq. 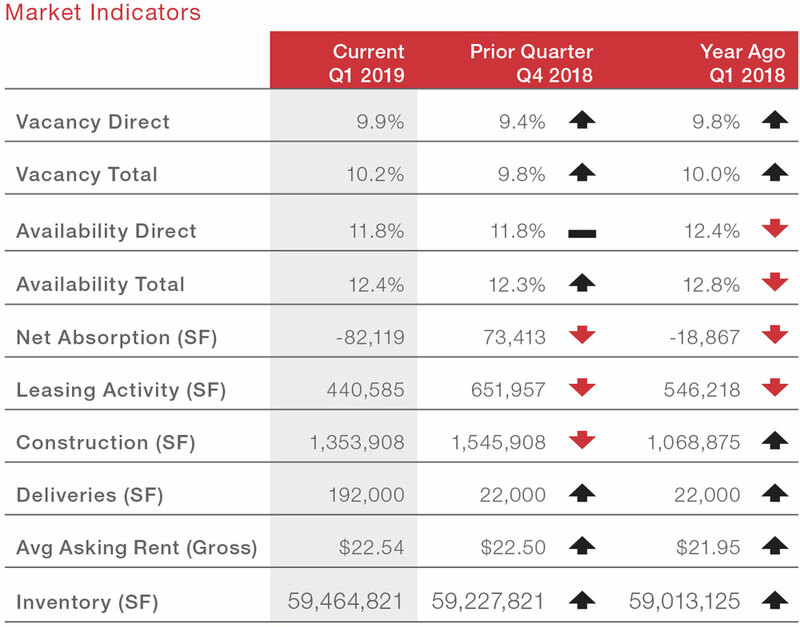 ft. of vacant space (8.5%) as of Q1 2019. Drilling down to the specialized space level, there is approximately 8.8 million sq. ft. of medical office space in the San Antonio market, representing 14.8% of the 59.5 million sq. ft. of total office inventory. The overall vacancy rate for medical office space is 16.4%. Pinnacle Oaks, a 21-acre master-planned business park located off of North Loop 1604 West in San Antonio is currently planning to break ground on the project’s next phase, named Pinnacle Oaks Centre 1, this summer. It will include a Class A five-story, 154,000-sq.-ft. office building scheduled to be completed in the summer of 2020. The first phase of the project, the 80,532-sq.-ft. Pinnacle Oaks Tech Center, broke ground late 2017 and finished construction in 2018. Once fully completed, the business park is planned to include 500,000 sq. ft. of Class A office space. 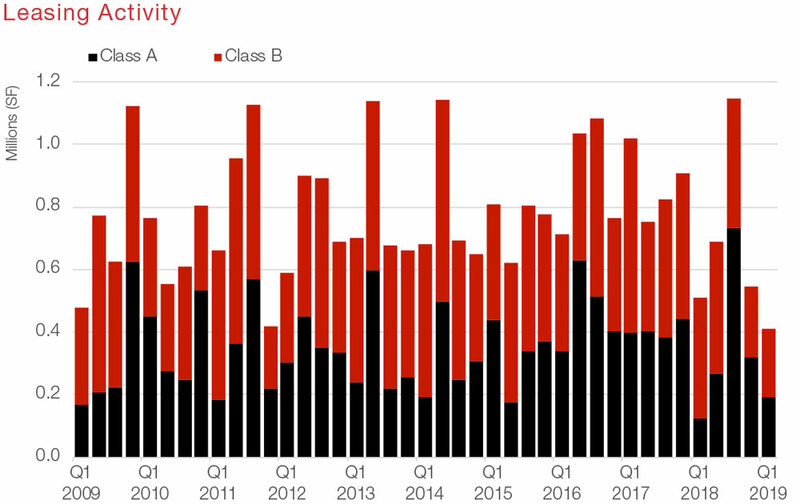 Real Capital Analytics data reports office sales volume for Q1 2019 in the San Antonio area at $49.6 million, compared to Q1 2018 at 133.1 million, resulting in a year-over-year quarterly volume change of negative 62.7%. 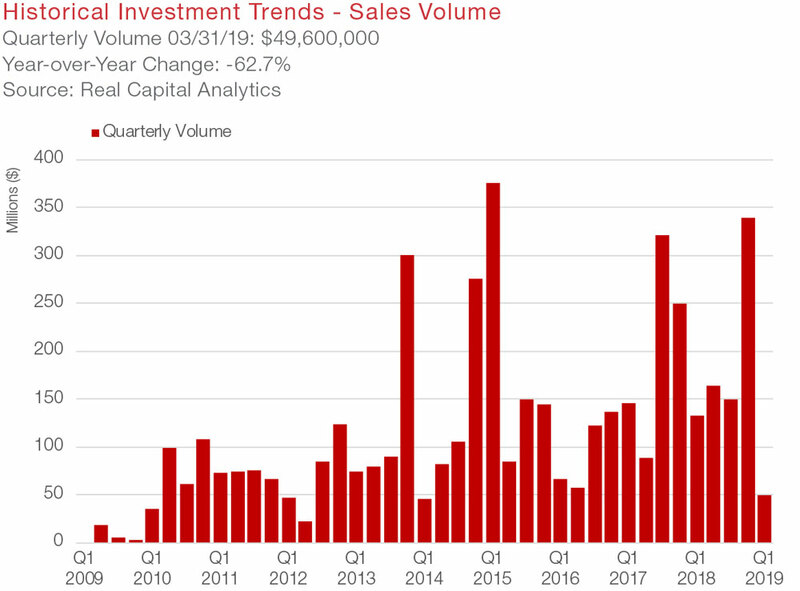 The primary capital composition for buyers in 2019 was made up of 100% private, and for sellers, the majority was 60.5% institutional, and 39.5% private. In March Milam Real Estate Investors purchased the 159,280-sq.-ft. Chase Center Oak Park suburban office building at 1020 NE Loop 410 in San Antonio. The eight-story, Class A office building is located between North New Braunfels and Nacogdoches Road in the North Central submarket and was 84.2% leased at the time of sale by TA Realty. PenFed Credit Union announced its new regional financial service center will be located at 19500 Bulverde Road in the North Central submarket of San Antonio. The expansion will create over 500 new jobs. PenFed is purchasing two contiguous sites; Site One will house employees starting in April on 12 acres with a two-story, 146,000-sq.-ft. office building, and Site Two will be on 16 acres accommodating an additional 100,000-140,000 sq. ft. of office space. Nearly 4 million sq. ft. of office space is under construction in San Antonio, of which more than 500,000 sq. 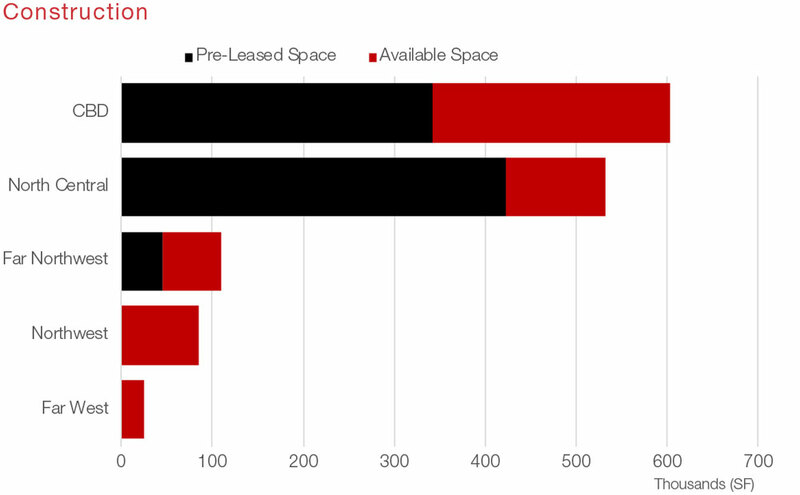 ft.—or 39%—is in the city’s North Central office submarket. Norton Rose Fulbright will take two floors for its San Antonio office at Frost Tower this summer. The company is said to be taking nearly 40,000 sq. ft. on the 17th and 18th floors of the new 23-story Frost Tower at 111 W. Houston St. The law firm will be moving from its 62,000-sq.-ft. office at the Bank of America Plaza at 300 Convent St. Frost Tower is scheduled to deliver early second quarter. In addition, Ernst & Young is reported to be taking 11,500 sq. ft. on the tower’s 19th floor, and Insight Global has signed a lease for 10,522 sq. ft. on 2nd floor. The total volume of square footage signed during the first quarter was at 441,000 sq. ft., with 114,000 sq. ft. (26%) in the Central Business District. A few of the metro’s other largest leases signed during Q1 2019 include a renewal for Baptist Health System School (66,263 sq. ft.) in the Northwest submarket, WeWork (57,248 sq. ft.) in the CBD submarket, Datamark, Inc. (20,099 sq. ft.) in the North Central submarket, and Clinical Trials of Texas (19,355 sq. ft.) in the Northwest submarket. The price of San Antonio’s office space is climbing as demand grows and development is booming. All over the city there is activity. 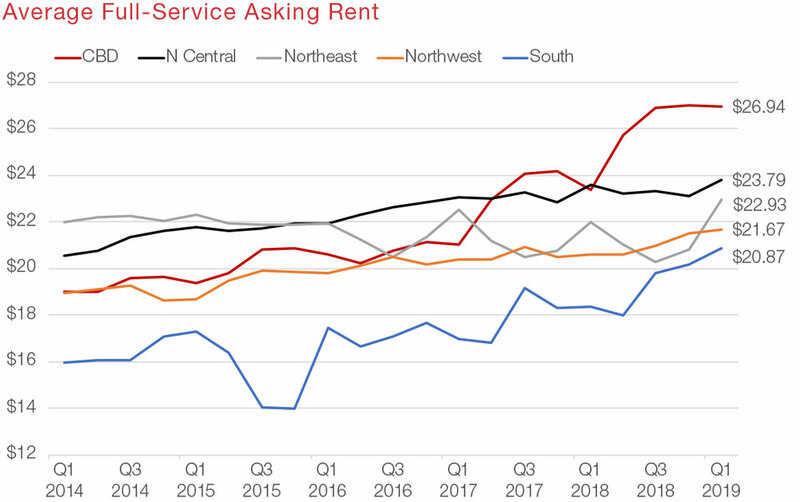 In the Northwest submarket, home to the South Texas Medical Center, the University of Texas at San Antonio’s main campus, and headquarters for USAA, Valero Energy Corp. and NuStar Energy, year-over-year full-service asking rents rose by $1.06 per sq. ft. at $21.67 per sq. ft. As a market indicator, concessions such as free rent and tenant improvement allowances make posted rents less meaningful as net effective rents can change significantly once negotiations begin. All said, with the top-dollar renovations, company relocations, and new Class A buildings being constructed, office tenants want to be where there’s a lot of activity and a mixed-use atmosphere that attracts young professionals and are willing to pay higher rental rates.